In the recently released edition of Dabiq, the Islamic State’s online English magazine, Abu Bakr al Baghdadi’s followers make their bitter rivalry with al Qaeda the centerpiece of their presentation to the public. 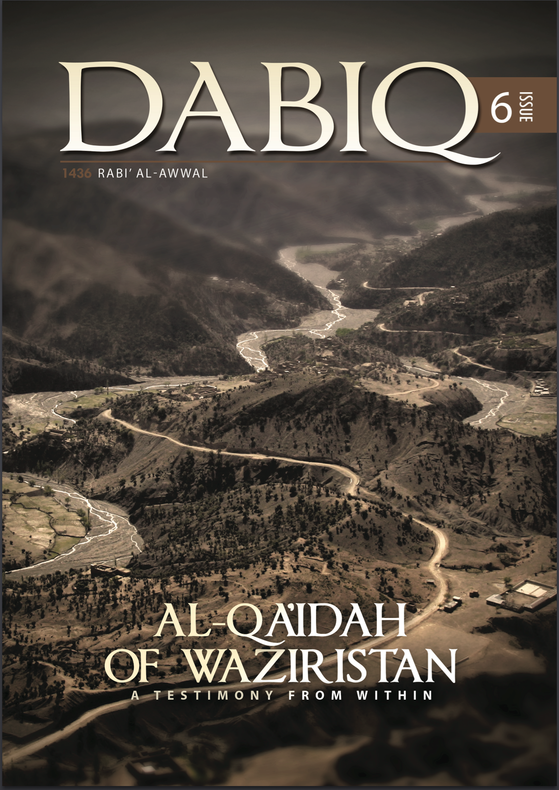 The cover story, entitled “Al-Qaidah of Waziristan,” is written by an alleged al Qaeda defector known as Abu Jarir ash-Shamali. His story begins before the Sept. 11, 2001 terrorist attacks, when he joined Abu Musab al Zarqawi’s organization, Jamaat al Tawhid wal Jihad, in Jordan. Shamali is keen to emphasize the differences between Zarqawi and al Qaeda from the first. It is easy to see why, as the Islamic State is attempting to portray Zarqawi’s legacy as entirely its own. Zarqawi, who formally pledged allegiance to al Qaeda in 2004, had been working closely with senior al Qaeda leaders years before he officially became al Qaeda’s man in Iraq. Zarqawi is still featured in both al Qaeda’s and the Islamic State’s propaganda. But in their retelling of Zarqawi’s and al Qaeda’s story, Shamali and the Islamic State made an odd editorial decision — odd, that is, from the perspective of a jihadist group that is trying to poach from al Qaeda’s and the Taliban’s supporters. Shamali portrays Osama bin Laden during the 1990s in a somewhat negative light. The gist of Shamali’s argument is that bin Laden pulled his punches with respect to the Saudi monarchy and other apostate regimes. Shamali criticizes what he sees as al Qaeda’s pre-9/11 “hesitance” to declare the “apostasy” of “rulers and their armies” throughout the Muslim majority world. In Shamali’s telling, this was the main point of tension between Zarqawi and al Qaeda’s leaders prior to their formal alliance. According to Shamali, it was not until sometime after 9/11 that bin Laden “declared the apostasy of the rulers of [Saudi Arabia] and their soldiers and the obligation to fight them in some of his addresses.” Only then did Shamali and his brethren change their view of al Qaeda “from what it was before” to a more positive opinion. By publishing Shamali’s piece, the Islamic State risks undermining its previous anti-al Qaeda propaganda efforts, which were misleading, but still had a cogent story to tell. The group also risks giving credence to its critics within the jihadist world. Citing Shamali’s piece, some of the Islamic State’s critics on Twitter have been quick to point out that Baghdadi’s followers are so extreme that they even attack the legacy of bin Laden, who remains wildly popular among the jihadists. Therefore, Shamali’s piece is not a smart attempt to win over al Qaeda’s followers. Shamali sees Deobandis as so deviant that he uses the word “Deobandis” as a pejorative to describe the two principal leaders of al Qaeda in the Indian Subcontinent (AQIS), Asim Umar and Ustad Ahmad Faruq. Al Qaeda “handed” them “the nerve center of the organization…corrupting all that was left,” Shamali writes. The Islamic State has been trying to cut into al Qaeda’s dominant market share within the jihadist community in South Asia. 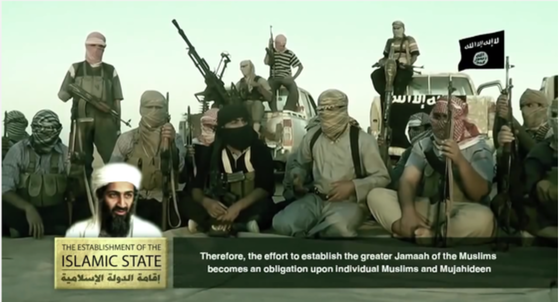 But Shamali’s piece will not help the Islamic State accomplish this goal. The Deobandi ideology shares many points in common with the Salafi jihadist traditions of the Islamic State and al Qaeda, but also has some differences. Instead of emphasizing their points of commonality, or ignoring any areas of disagreement, Shamali portrays Deobandis in a wholly negative manner. Shamali argues that al Qaeda’s efforts to “alienate” the many jihadist groups in South Asia “from the Islamic State and [to] incite them” against Baghdadi’s group “failed,” because “many” of these groups have either given their bayat (oath of allegiance) to Baghdadi “or are on their way to doing so.” However, at this juncture, there is little evidence to support Shamali’s claim. Only a select handful of jihadist commanders in South Asia have announced their allegiance to Baghdadi. The Islamic State’s blatant disrespect for the Taliban will not help it grow in the South Asian jihadist market. Shamali also concedes that he had a bayat to both Mullah Omar and Ayman al Zawahiri before swearing his allegiance to Baghdadi, thereby breaking his previous oaths of allegiance. It is likely that many jihadists will not look upon his admission in a positive light, as Shamali will be perceived as an oath breaker. Shamali spent most of the period after 9/11 in Iranian custody. Shamali says he first left Jordan to wage jihad abroad sometime in 2002 or 2003, but he was detained in Iran while attempting to make his way to Afghanistan. He was released in 2010. Shamali’s story contains multiple indications that al Qaeda’s bureaucracy continues to function despite setbacks caused by its jihadist rivals and other enemies. For instance, Shamali says that upon arriving in Miranshah, Pakistan he “wrote a message to Lajnat Bukhārā,” or “the Committee of Bukhārā – an administrative committee belonging to the leadership of” al Qaeda. Shamali says the committee was set up after al Qaeda lost two senior officials, Atiyyah Abd al Rahman and Abu Yahya al Libi, in drone strikes. A senior al Qaeda official named Muhammad bin Mahmoud Rabie al Bahtiyti, also known as Abu Dujana al Basha, is identified as a member of the committee in Shamali’s article. The al Qaeda defector says that he met with both Bahtiyti, who has been highly critical of the Islamic State, and the unnamed leader of the Lajnat Bukhārā. The Lajnat Bukhārā has received little to no attention in the West’s public discussions of how al Qaeda is structured, but Shamali’s story is an indication that al Qaeda still operates committees as part of its hierarchy. Shamali explains that another committee, the “Security Committee,” was “expelled from” al Qaeda, “removed from the field, and forced to remain in their homes” after it was decided that members of the committee had mishandled a controversial situation. Of course, al Qaeda must have had enough of a bureaucracy in place to hold members of the committee accountable in this fashion. And it is likely that the “Security Committee” was replaced in some capacity. Al Qaeda decided to evacuate many jihadists from the areas of northern Pakistan where they had been holed up for years, Shamali notes, adding that they had been asked to swear allegiance to the Al Nusrah Front even before they relocated to Syria. The Al Nusrah Front, an official branch of al Qaeda, was still part of the Islamic State when al Qaeda began moving its personnel to Syria, Shamali says. He introduces this anecdote in an attempt to portray al Qaeda as scheming against the Islamic State before the two sides had their falling out. But it is further confirmation of something that we know from other sources: Al Qaeda moved personnel out of the American drones’ strike zone in northern Pakistan to safer areas. Shamali also reveals that those al Qaeda commanders who broke their allegiance to Zawahiri were immediately cut off from al Qaeda’s payroll. Only a functioning accounting department could make such move. Shamali says this “counsel and planning was in order to gather Kurdish personnel — both military and [sharia officials] — from [al Qaeda] to assist them in training inside Afghanistan so as to operate in Iraq after passing through Iran.” Shamali points out that Ansar al Islam published a video highlighting its Sheikh Rashid Ghazi Camp, which was named after an infamous Pakistani jihadist. The video, which was posted online in early March 2014, included a clip of bin Laden praising Sheikh Ghazi. Shamali argues that even though Ansar al Islam was marketing its adherence to al Qaeda’s ways, and meeting with al Qaeda’s senior leadership, the anti-Islamic State gambit failed. “Allah made their plot futile,” Shamali writes, “for Ansar al Islam declared their [bayat, or oath of allegiance] to the Islamic State.” At least part of Ansar al Islam issued a statement swearing allegiance to the Islamic State in the summer of 2014, while another faction remains active in Syria. There continue to be rumors suggesting that al Qaeda will be relaunching its official presence in Iraq in the near future, but that has not been confirmed. Thus, Shamali’s portrayal of al Qaeda is not consistent with Western claims that the group can barely function in South Asia. ISIS disparaging Deobandis is not surprising. Muslims from the Middle East have always looked down on the Muslims of South Asia as religiously, culturally and ethnically inferior to themselves. South Asian Muslims are “impure” in the eyes of the Arabs and other Middle Easterners on one side and impure in the eyes of the so-called “upper caste” Hindus on the other. Where does this leave the Pakistani and Indian Muslim that is caught between these two prejudices? Pakistan was a name invented with these historical prejudices from Middle East and Hindus in mind to give a sense of self-esteem and dignity to the South Asian Muslim, who had never ruled himself in northwest India before, always having been subjugated and denigrated throughout his history by bigots both Muslim (foreign) and Hindu (his former kin) alike. But now even Pakistan has crushed and sold the dignity and esteem of the South Asian Muslim to the racist Middle East once more. Arab supremacy runs rife in both Arab secularists and Arab Islamists. But the bloody fools of Pakistan, India and Bangladesh are always first ones to sign up to serve Arab causes and Arab calls for jihad even while Arabs are ridiculing their culture and traditions. One of the drivers behind the South Asian Muslims’ turn to extremism and radicalism is from shame for his own culture and traditions which in the eyes of the Arabs are “Hindu” and therefore, un-Islamic and inferior. The Pakistani and Indian Muslim is always desperate to impress the Arabs and show them that he is not a “Hindu” by his enthusiasm to fight “jihad” for the Arabs even while Arabs in turn still mock him and use him to fight on the front line of the Arabs’ self-cooked ‘holy’ wars. Arabs have always disparaged and attacked the peaceful and spiritual Islam of the South Asian Muslim, mocking the Sufis and Barelvi as “Hindu”. Now they even attack the fundamentalist Islam of South Asia, the Deobandis. Why should anyone be surprised at this revelation? A penetrating and well reasoned critique. With the price of oil plummeting, DAESH will assuredly identify new revenue streams in new venues even while it continues to consolidate its gains in the Levant. We can only hope that al Baghdadi’s insatiable hubris will continue to preempt any prospect of reconciliation in the next 10 years. Based on recent experience, it will apparently take us at least that long to train and deploy forces willing and able to engage them. There are quite a few holes in their story here. Most importantly is that Bin Laden made Takfir or labeled the Saudi government and royal family apostates back in 1995. It’s obvious they’re making an attempt to discredit AQC but taking shots at the dead leader and father of modern jihad isn’t the way to do it. Even ISIS members refer to Bin Laden as their “beloved Sheikh”. So this can’t provide any value to their recruiting tactics.